There are already some cool events popping up fighting the two (dumb) amendments that are on the ballot in 2012, with another one just being announced. 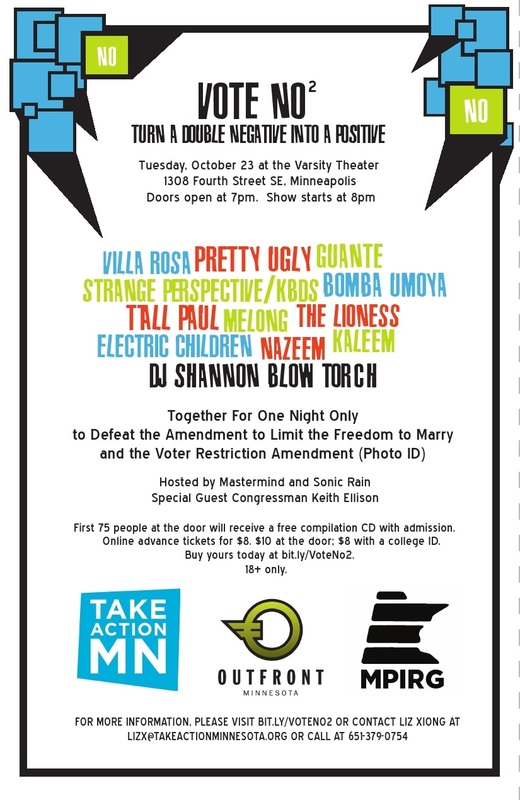 On Oct. 23rd (next Tuesday), the Varsity will host a great show of local artists in a benefit titled Vote No Squared. The lineup is heavy on local hip hop and is a nice addition to the already cool shows that are piling up, showing the Minnesota artistic community united against both measures. Check out the flier above for details on the show and pick up tickets in advance to save a few bucks on admission.